Imagine that you awaken one day to find that you and your family are suddenly targeted as people who "don't belong". You are told that your kind is not welcome, that your beliefs are not right, that your ideals are illegal. Police begin to stop you on the street because you don't have the right papers. Family members have been jailed and beaten. You begin to hear rumors that neighbors have been killed. Fearing for your safety, you escape across the border where you are suddenly part of a vast number of homeless people, depending upon others to give you food and shelter. Years drag by as the situation in your home worsens and you realize you may never be able to return. Eventually, your only hope to look forward to is going to a foreign country willing to give you a chance to start over in freedom. Many of us would like to think that such events are quite extraordinary---that they are points noted in the history books that do unfortunately occur but are surely unique and rare. In actuality, the refugee experience is a sadly common one. Millions of people in the world are displaced from their home due to conflict and persecution. Of these, a minute fraction have the chance to resettle to a third country each year. 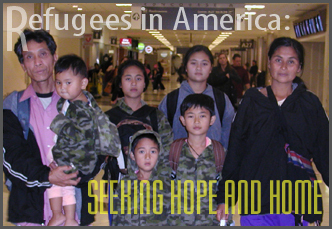 The following pages offer information about my involvement with refugees through World Relief, a resettlement agency in Atlanta, where I have worked for over twelve years. During that time, I have had the chance to meet numerous such individuals who have fled in the face of grave persecution and real fear and many whom have literally never known life outside of a refugee camp. Some of their history and stories can be found here.